The Expert Advisor works on the basis of correlation between two currencies. When the limit of correlation of signals is reached, it performs a trade operations. Limit is 0.8. TotalTakeporfit - take profit value, default is 180. Stoploss - used for trading with martingale, default is 220.
check - timeframe of the indicator, default is PERIOD_M5. 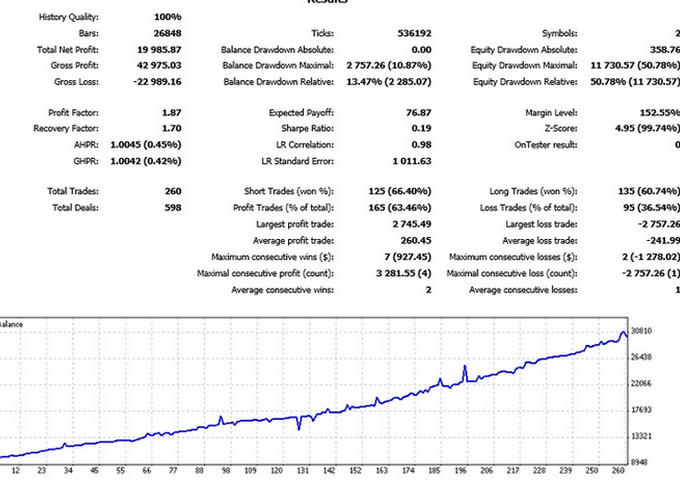 MagicNumCycle1 - magic number of the Expert Advisor, default is 1347.
usedspread - check spreads. The sum of spreads of three currencies, default is 1.
maxspread - maximum spread, default is 65.